Male cheetah Kasai received extensive treatment using the latest technology, but in the end staff had to make the difficult decision to put him to sleep. The team from Cave Veterinary Specialists included Tom Cave, a RCVS recognised specialist in Small Animal Internal Medicine and Philip Strom, an American specialist in Veterinary Diagnostic Imaging who had just arrived in the country from the USA; this was his first day in the job. They also brought their vet nurse Anna Grew. In addition, Stephen Mavin from Imotek International Ltd, a company based near Cambridge who supply ultrasound and MRI scanners, was on hand. Christa was lead vet on the case and responsible for the anaesthesia, with Zoo vet nurse Celine Campana also on hand. 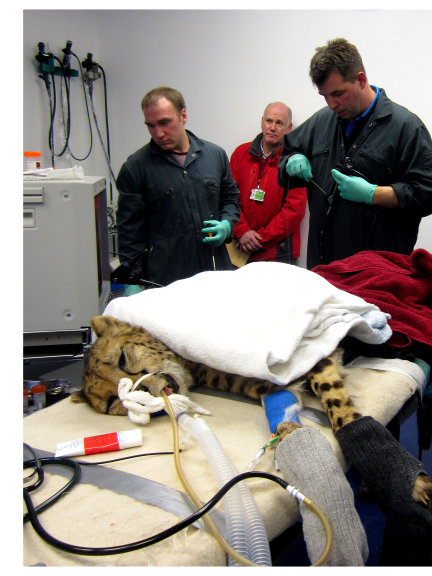 Kasai was anaesthetised at the cheetah house, and once asleep and stable, transported to the Zoo’s specialist Vet Centre. “Once Kasai was connected to all the equipment and fluids, Philip did an ultrasound of the abdomen and took some biopsies of lymph nodes and liver. After this Kasai was repositioned for endoscopy and colonoscopy and again some samples of the different parts of the gastro-intestinal tract were taken. All these samples, together with blood samples taken at the beginning of the procedure, were sent to specialist laboratories for analysis. Then we woke him up in a crate and kept him at the Vet Centre for an hour or so until he was awake and fit enough to be transported back to his den. Ghislaine Sayers, Paignton Zoo’s Head of Veterinary Services, said: “We contact specialists to help us provide the best possible care for our animals - this case was a good example. Tom Cave and his team were incredible – we spoke several times to Tom before the procedure about treatment options and diagnoses. Once the results came back, he helped interpret them and draft a treatment plan. He was so keen to help us - his input was invaluable, even though the outcome was sad. On the day they brought probably about £50,000-worth of extra equipment with them!” Paignton Zoo Environmental Park is a registered charity. For more information go to www.paigntonzoo.org.uk or ring 01803 697500.